While there is currently great uncertainty about how Brexit will unfold, it seems highly likely that the final settlement will involve some reinstatement of immigration controls between the UK and the EU. So, one important question is how this might affect the flow, identification, and protection of people trafficked into the UK. Our understanding of the precise role played by migration controls in human trafficking is patchy. This is partly because trafficking is by its nature hard to measure. It’s partly because there is, as yet, no systematic research of the sort that would produce reliable evidence. And it’s partly because the increasingly politicised nature of the debate confuses an already incomplete picture. Nevertheless, the need to migrate to escape danger, oppression and/or poverty and the restrictions placed on such migration are generally considered features common to trafficking experiences. For example, in recent years we have seen frequent assertions of a causal connection between tough border controls and increased reliance of people on illegal routes and threatening individuals. The zealous enforcement of border controls has also been shown to hamper the identification of victims of human trafficking. Under both the Council of Europe’s Convention against Trafficking, and the UK’s most recent guidance, border forces must be proactive in spotting potential victims at the border. But the border force’s singular focus on enforcing migration controls can make officers blind to indicators of victimhood, including some specific types of behaviour and responses to questioning, as well as interaction with travel partners. Officers looking to exclude as many illegal migrants as possible can end up focusing too much on the credibility of the travellers’ stories and not enough on their vulnerability. The consequences of the misidentification of victims of trafficking as illegal migrants can be detention, deportation and re-trafficking. In light of these concerns, proposals have been voiced for the relaxation of border controls and the establishment of “safe migration” routes. Yet even if the removal of borders were politically achievable, there are reasons to be cautious in our expectations of how that might benefit victims. Claims about the causal connection between migration control and human trafficking rest on an assumption that those trafficked are nearly always illegal migrants. But this is contradicted by the European experience. EU freedom of movement is the most ambitious border-free experiment of modern times. 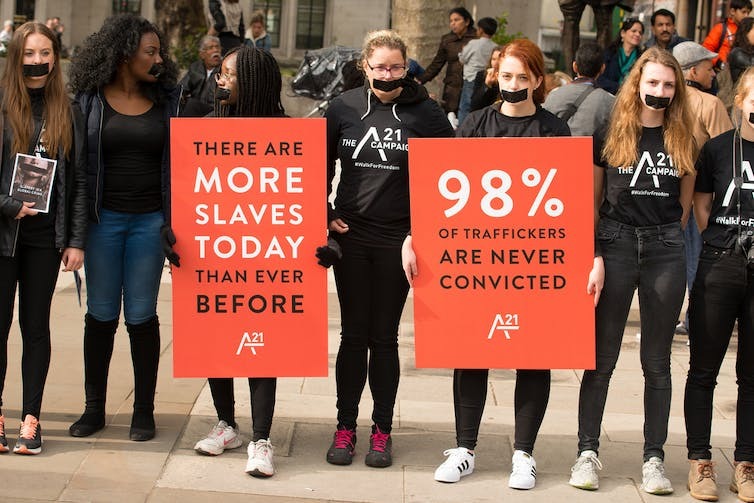 However, recent estimates from the European Statistics Agency show that 65% of victims of trafficking registered in the EU are themselves EU citizens. UK records confirm this – in 2014, between half and a third of all recorded victims were EU citizens. This rises to 78% for those exploited for labour. Free movement has made it even tougher to spot victims of modern slavery from the EU as they arrive in destination countries legally. This means [European Economic Area] citizens do not come to the attention of either police or immigration and borders agencies. This is echoed by soon to be published research we carried out in 2015 with border force officers working as anti-trafficking first responders at Heathrow Airport. They reported being required to move EU citizens through the border so quickly that it was almost impossible for them to identify victims. The conflict between border control and anti-trafficking they describe is not the one referred to typically – namely the risk that victims of trafficking are miscategorised as mere illegal migrants – rather, it is the risk that victims of trafficking are wrongly categorised as legal migrants. How can we square this with the preceding claims that the implementation of national borders aggravates trafficking? Both may be correct. But attempts to move beyond mere speculation are currently hindered by the politicised nature of the debate. As so often happens with the controversial issue of immigration, arguments are frequently put to the service of preexisting political positions. 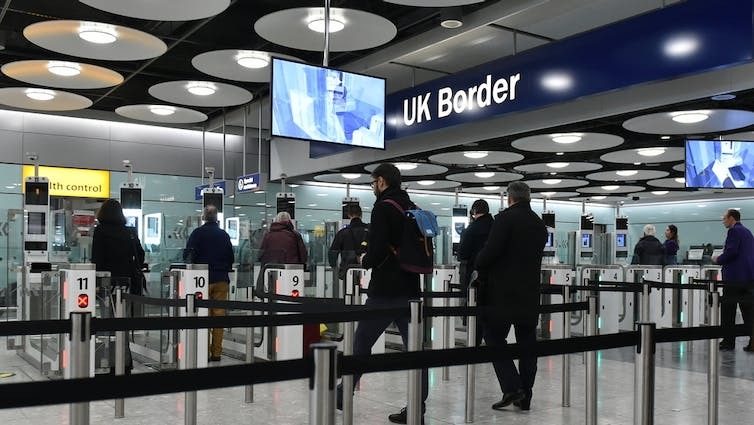 For example, it is unsurprising that border force officers, whose professional identity is premised on the need to enforce immigration and customs regulations, would see stricter border controls as an obvious solution to the problem of trafficking. Equally, the Centre for Social Justice is a right-leaning think tank which is sceptical about the benefits of free movement. On the other hand, “safe migration” routes and similar solutions are typically championed by those who are already troubled by the contribution of migration controls to human suffering. If we want to be prepared for the changes to come, we need research that can cut through the politics and deliver a much broader, more contextually informed and better evidenced understanding of the drivers of human trafficking into the UK.